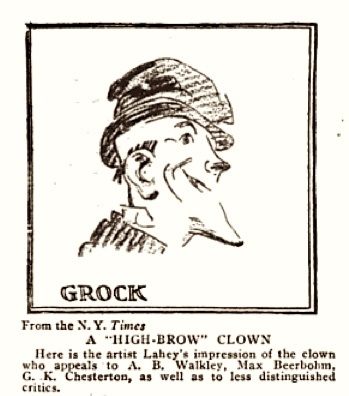 "Grock ... is a sort of clown. Yet no; one must distinguish. There are clowns and there is Grock. For Grock happens to be an artist, and the artist is always an individual. After all, as an individual artist, he must have invented himself. It was a remarkably happy invention. . . . Victor Hugo (and the theme would not have been unworthy of that lyre) would have described it as a series of antitheses. It is genial and macabre, owlishly stupid and Machiavcllianly astute, platypode and feather-light, cacophonous and divinely musical. Grock's first act is a practical antithesis. A strange creature with a very high and very bald cranium (you think of what Fitzgerald said of James Spedding's: 'No wonder no hair can grow at such an altitude') and in very baggy breeches waddles in with an enormous portmanteau, which proves to contain a fiddle no larger than your hand. The creature looks more simian than human, but is graciously affable—another Sir Oran Hautton, with fiddle substituted for Sir Oran's flute and French horn." "To watch Grock is to be a youngster again, a youngster whose enjoyment of what he sees is enhanced by the grown-up intelligence which makes being a youngster again, while a good clown is about, such refreshing entertainment. There is a polish, a finished quality, about Grock's foolery which we do not remember among the circus clowns of our boyhood. The circus clown rushed through his bit mechanically. Grock seems to think his fun as he goes along. Back of those innocent eyes, that ludicrous face, with the suddenly protruding under jaw, a jaw of massive size, there is apparent an equanimity of thought which in less skilful clowns might more properly be called vacuity. "It is this equanimity that makes the unexpected in Grock's work so laughable. He is playing his midget violin in all seriousness. Suddenly he falls through the chair. He is playing the piano like a pianist of parts. Like a flash he throws in one bit of burlesque which topples him over into the ridiculous again. He knows the value of contrast. All fooling and no sense makes anyone a dull clown. Grock proves this. He is never dull. Especially when he is talking. How did he develop that voice? On the slightest pretext it drops from a vapid wheedling to a rich, resonant bass." The mystery of the new clown is sought elsewhere by the indefatigable S. Jay Kaufman, of the N. Y. Globe. The man is essentially an artist, and he knows how to awaken appreciation of his art. "There's a much more important reason as we see it. The man does something. He plays the piano superbly. And the other instruments are added powers. We used to hear that the clown in the troupe was always the best acrobat of the lot. We never believed it until we saw them rehearse one day. Grock has taken his cue from the acrobat. He is a clown, but he is a musician first. 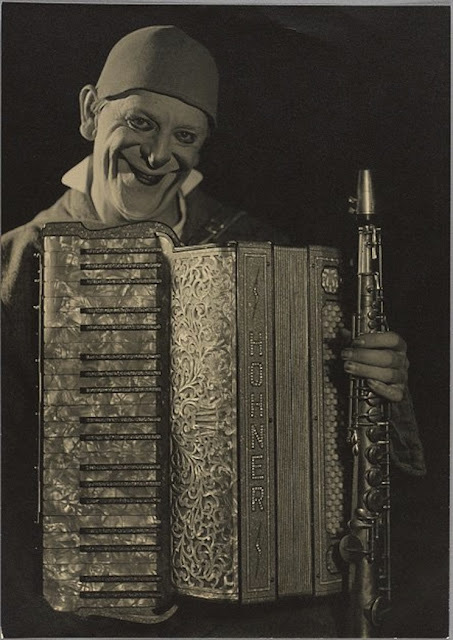 The clowning in vaudeville, alas! gets him the huge salary, but who cares about his salary so long as we have him? His nonsense is sheer nonsense, which is the best sort of nonsense. That the man is an artist one gathers from the bits of fine music he quietly slips in between his bits of nonsense." Mr. Walkley has invoked Benedetto Croce, Aristotle, Jean Paul Richter and other erudite authorities in his effort to clear up the mystery of the clown. But the London critic despairs of any adequate solution in words. "It is the old difficulty of transposing the comic from three dimensions into two, and when the comic becomes the grotesque, then the difficulty becomes sheer impossibility." "Why does this queer combination of anthropoid appearance, unearthly noises, physical agility and musical talent—so flat in description—make one laugh so immoderately in actual presentation? Well, there is, first, the old idea of the parturient mountains and the ridiculous mouse. Of the many theories of the comic (all, according to Jean Paul Richter, themselves comic) the best known perhaps is the theory of suddenly relaxed strain. Your psychic energies have been strained (say by Grock's huge portmanteau), and are suddenly in excess and let loose by an inadequate sequel (the tiny fiddle). Then there is the old theory of Aristotle, that the comic is ugliness without pain. That will account for your laughter at Grock's grotesque appearance, his baggy ureeches, his beetle-like dress clothes, his hideous mouth giving utterance to harmless sentiments. Again, there is the pleasure arising from the discovery that an apparent idiot has wholly unexpected superiorities, acrobatic skill, and virtuosity in musical execution. But not such a fool as he looks is the class-badge of clowns in general. There is something still unexplained in the attraction of Grock. One can only call it his individuality—his benign, blat-d outlook on a cosmos of which he seems modestly to possess the secret hidden from ourselves. One comes in the end to the old helpless explanation of any individual artist. Grock pleases because he is Grock."